Article illustration for Galago #127 (2017).Lisa MedinArticle illustration for Galago #127 (2017).Illustration for an article about a reservoir pen convention. Painted digitally using Clip Studio Paint. Poster for SF-bokhandeln, 2018Lisa MedinPoster for SF-bokhandeln, 2018Poster used for marketing events at the different SF-bokhandeln bookstores. Summer 2018. SF-bokhandeln PRIDE, 2018Lisa MedinSF-bokhandeln PRIDE, 2018Poster used for marketing events at the different SF-bokhandeln bookstores. Summer 2018. Emara with Recka (2017)Lisa MedinEmara with Recka (2017)"Emara hos Recka" från Stefan Hagels "Projekt ESOS – bild möter text" (arbetstitel). Tecknad, tuschad och färglagd digitalt i Clip Studio Paint. Draw the Line – Boss Lady (2018)Lisa MedinDraw the Line – Boss Lady (2018)Extract from the short story Boss Lady, published in comic anthology Draw the Line (Doob förlag, 2018). Illustration till artikel på numrets huvudtema. Digitalt skissad, tuschad och färglagd. Artikelillustration för tidningen Kvinnotryck (februari 2017).Lisa MedinIllustration till artikel på numrets huvudtema. Digitalt skissad, tuschad och färglagd. Artikelillustration för tidningen Kvinnotryck (februari 2017).Illustration for an article on the issue's main subject. Digitally sketched, inked and coloured. Client: ROKS. Zombie cover for MetroLisa MedinZombie cover for MetroCover illustration for Metro Stockholm's weekend edition, WKD. Published 21st of October 2016. "The samurai", fall 2017Lisa Medin"The samurai", fall 2017Comic strip for the Science Fiction bookstore's fall catalouge. Digital sketch, ink and colouring. Chapter illustration, the Science Fiction bookstoreLisa MedinChapter illustration, the Science Fiction bookstoreIllustration for the Science Fiction Bookstore's anniversary book, 2015 (not yet published, shared with permission). Sketched in pencil, traditionally inked with a nib on bristol paper, and finally coloured digitally using Adobe Photoshop. Illustration for magazine Kvinnotryck, 2018Lisa MedinIllustration for magazine Kvinnotryck, 2018Article illustration for Kvinnotryck no.2/2018. Article illustration about eating and food, 2016Lisa MedinArticle illustration about eating and food, 2016Illustration for National Organisation for Women’s Shelters and Young Women's Shelters in Sweden's magazine Kvinnokraft, for an article on the subject of the complicated feelings about food and eating. Page from Medley 2 (2017)Lisa MedinPage from Medley 2 (2017)Exert from Medley, vol. 2, planned to be released by publisher house Galago during 2017. Inked with a steel nib on bristol paper, original storyboard, sketch as well as screentones are made digitally with Clip Studio Paint. Magazine article illustrationLisa MedinMagazine article illustrationIllustration for an article published in the spring edition of National Organisation for Women’s Shelters and Young Women's Shelters in Sweden's magazine, Kvinnokraft. The Man Machine (page 9), 2014Lisa MedinThe Man Machine (page 9), 2014The Man Machine is a short story taking place in the same world/setting as my on-going comic series Medley (Kolik publishing 2013, Ordfront Galago 2016). The comic was originally published as a free stand-alone comic book at Stockholm International Comic Festival in may 2014, and later it also graced the pages of Utopi Magazine #14 and is now available as a free download through Egmont Publishing's app Seriecentralen. Page 9 out of 16. Excerpt from "Women only draw comics about menstruation"Lisa MedinExcerpt from "Women only draw comics about menstruation"Excerpt from graphic novel anthology "Women only draw comics about menstruation", Kartago publishing 2014. The comic is pencilled, inked with steel pen nibs and finalized with water colours. It is an autobiographical, 5-page story about approaching the subject of menstruation, the female body and expectations placed upon it and the roles it plays – as well as how to come to terms with one's own body. The path to a Christmas card (2016)Lisa MedinThe path to a Christmas card (2016)Step by step process how the 2016 Christmas card came to be. This was sent out to all of my clients and some collegues. 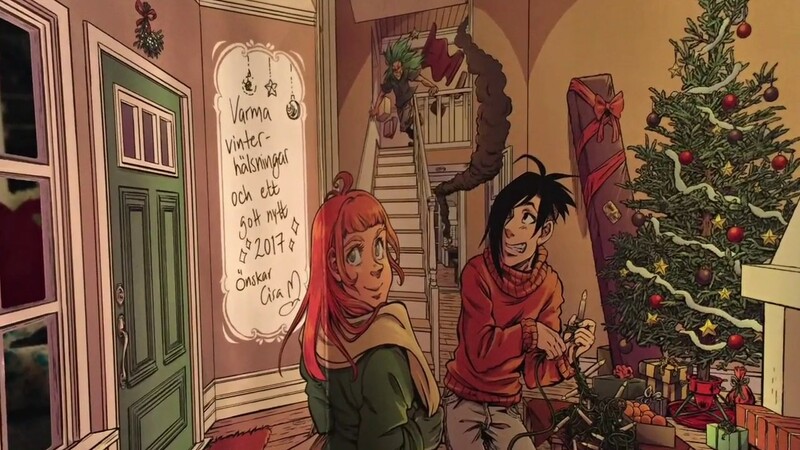 Illustrator and comic artist from northern Sweden. My academic merits include the Comics and Visual Storytelling Programme (Comic art school) at University of Gävle, The Comic school in Malmö as well as Comic Art and Advanced Storytelling at the University of Gothenburg. I like dynamic art with mometum, something that comes in handy when drawing my action/adventure story Medley (Kolik publishing 2013, to return at Galago Ordfront publishing in 2016). I also draw comic strips regularly for the Science Fiction Bookstore, participate in several graphic novel anothologies and have been known to do drawing tutorials for children as well as informative illustrations. In the future, I aim do great work for a younger audience, branching out in books, games and media.